We are the very essence of a “mom-and-pop” business. Our story started right here in Monterey in 1948. Since that time we’ve installed well over a thousand heating systems and run thousands of miles of gutters, downspouts, flashings and ductwork. And we did it mostly by ourselves. 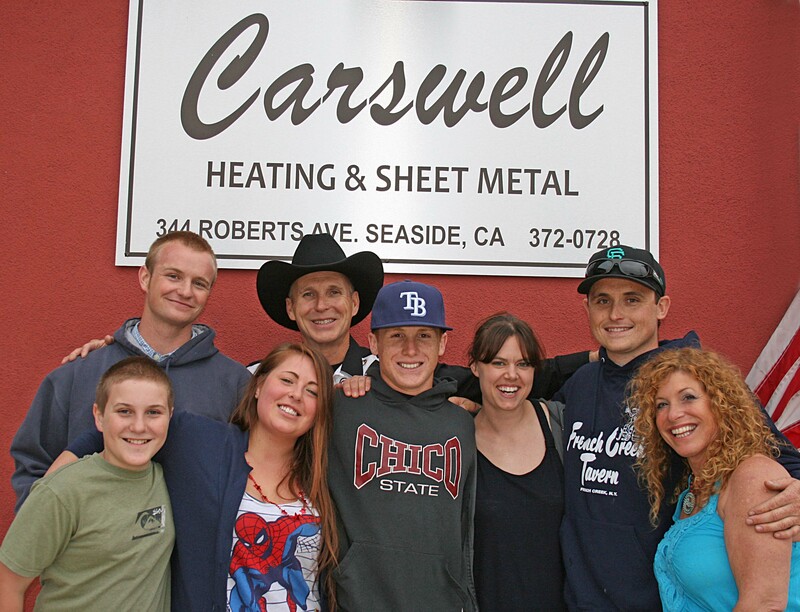 When you call Carswell’s Heating and Sheet Metal a Carswell will answer the phone, come out to your home or business and address all of your heating and sheet metal needs. We, the Carswell’s, have always kept the business in the family. Our business has flourished for three generations because we have closely adhered to the principals of our founder, grandfather and father Calvin Robert Carswell, Sr. since he first opened the doors in 1948 we’ve had a certain way of doing business. First, we don’t send large crews of strangers all over the area. In fact, we rarely, if ever, send others to work for our customers at all. When you call Carswell’s Heating and Sheet Metal a Carswell will answer the phone, come out to your home or business and address all of your heating and sheet metal needs. We believe that no employee can possibly value and serve our customers as well as we have for over 70 years. Which leads us to our next point. We all live here on the Monterey Peninsula. It’s a small place and word travels fast – and we wouldn’t have it any other way. We get the lion’s share of our business through referrals from family, friends and previously satisfied customers. You won’t see a full page ad in the yellow pages under “heating” because we’ve never had one. You are likely, however, to have seen or heard of us through your neighbors, coworkers, families and friends. That’s because we know how important our reputation is and we honestly care about the value your home affords you through the work we do day in and day out. We don’t refer to our customers as “jobs” because to you it is so much more than just a “job”. It is your home, retreat and where your children grow up. We understand that and we are committed to providing your home and family with the attentiveness and care that only another local family can provide. Should our paths cross when you need a new heating system or sheet metal work you can rest assured you will receive the same quality, consideration and respect that you would have in 1948. If there’s ever a problem you can get a hold of us, anytime. We still service furnaces that we installed back in 1950 and look forward to servicing your heating system in 2050. Thanks for your time today and we will be looking forward to meeting you. Call us at 831.372.0728 to start saving money and experience the Carswell Experience!